It has been one month since we moved into our new offices at 161 Collins Street, Melbourne, the T&G Building. It has been beautifully refurbished and we look over the atrium giving us natural light. We are all enjoying being back in the CBD, if you are up the Paris end of Collins St, drop in! 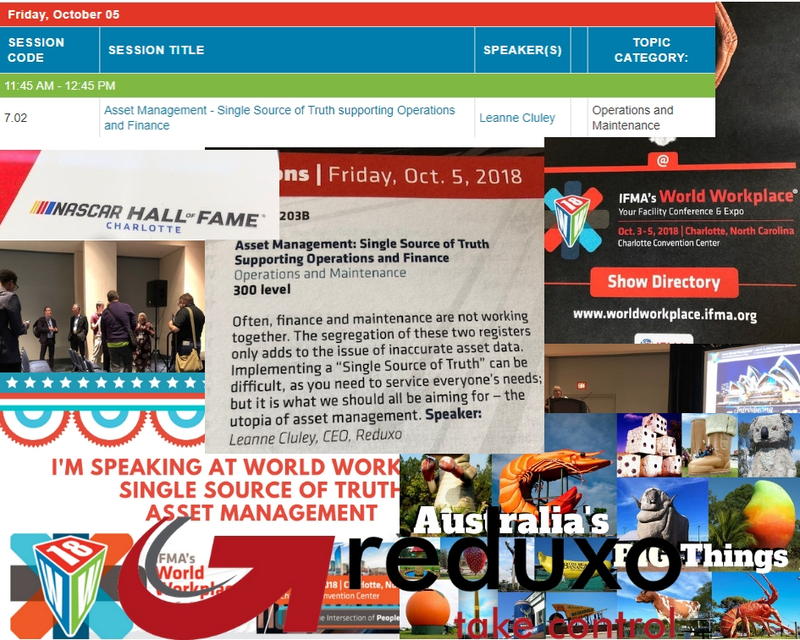 Reduxo’s Leanne Cluley was recently in Charlotte North Carolina to speak at the International Facilities Management Association (IFMA) Work Wokplace Conference on Asset Management Single Source of Truth. With the assistance of our marketing guru Heather Smith from Write Approach Marketing, we came up with the idea that Asset Management or more specifically Asset Audit Data is Big Data. Let’s make that a bit more interesting and simpler to understand and call it a Big Thing. Then let’s “Australianise” it and when we think of Big Things in Australia we think of the Big Banana, the Big Pineapple, etc. So what started as an asset audit data presentation on the importance of having an accurate asset base became a history lesson on Australia’s Big Things. Our international friends were able to relate as they also have Big Things or as they call them in America, Large Roadside Attractions! The presentation concentrated on the importance of asset auditing but also why and how. Leanne shared many case studies of projects she has been involed in over the years and how they affect the ongoing management and lifecycle of the assets. Leanne said “….it was a privledge to be invited to speak. The sharing of case studies ensured the particpants were able to relate to the benefits of completing an asset audit and having an accurate asset base to plan and mantain their facilities”. It might be a bit late but it is still good news! Reduxo's Leanne Cluley who co-chairs the Facilities Management Association (FMA) Diversity Portfolio Group attended the FMA's annual conference Ideaction in Cairns in May this year. With an exciting array of speakers and the networking at the social functions, it was again a great conference. Well done to the FMA! At the annual dinner, the Diversity Portfolio Group was awarded committee of the year, whilst it was a surprise it was recognition for the hard work and dedication by it's members. Leanne said "Whilst my original passion and reason for joining the DPG was gender based around the lack of females in our industry, it is now so much more. With the launch of the Indigenous Strategy at Ideaction this year, diversity has evolved to include culture, disability and more. It is great for all the team to be recognised for what is a volunteer role, we were thrilled to win." The DPG is focused on recognising diversity leadership and participation that promotes best practice and encourages innovation within the industry, whilst respecting and appreciating differences in ethnicity, gender, age, national origin, disability, sexual orientation, education and religion. Reduxo's "Get the Asset Audit Done This Time"
Asset Audit's are not usually someone's core job, yet they are required to be done periodically either for operational, financial or compliance. We have been busy on a number of projects this month but the most rewarding has been 7 hotels completing an asset audit in Melbourne, Brisbane and Sydney. To ensure consistency of data, some of the staff stayed in Brisbane and Sydney at the hotels including our "employees of the month" Michael and Allison. Our Canadian auditors have worked on 2 projects for us over the last 9 months and are on their way home today. We are both happy and sad. Happy to have worked and played with them and sad to see them go. Michael was introduced to us through an agency in Sydney. Not only was he great with the tablets, barcode scanners and audit software he was extra tall and able to reach exit lights without a ladder, keeping him safe and Reduxo's safety record in tact. He asked a lot of relevant questions and soon became one of our best auditors. He text'd our project manager Leanne one day saying how his girlfriend Allison was way smarter than him and would be a great auditor. In the next few weeks we took on Allison as well and Michael was right, she was a great auditor and superior to her colleagues with the number of assets she audited per day and more importantly the accuracy. Allison's stature meant she was much better suited to assets closer to the ground and so they became a formidable team working on high and low assets. Michael practised his aussie slang via text using words such as mate, bonza and fair dinkum with Allison correcting him on the correct use but he did try! Once the Sydney project finished, they traveled for a while but kept in contact and made their way to Melbourne. To ensure they had a true Melbourne experience we arranged to take them to an AFL game Carlton v Collingwood at the MCG with over 80,000 people. We traded sports stories (our footy, their ice hockey), food (our meat pies, their maple syrup) and bonded over sport. Whilst our accents were different, our sports different and our food different, we were really pretty much the same. Canadians and Australians work hard, love to travel, love sport and to meet others. So when the hotel project commenced it was a great opportunity for Michael and Allison to work in Melbourne and then in Brisbane and Sydney. We opened the returned parcel yesterday with their Reduxo polo shirts, tablets, barcodes, etc and there was a lovely thank you note and a doodle of them both as "employees of the month". We think you were both employees of the month and safe travels home, keep in touch. It was a pleasure for Leanne Cluley our CEO to be asked to have a "member profile" interview in the facilities management premier magazine Facilities Perspective for September 2016. Leanne talked about how the industry is changing in what she thinks is for the better such as the use of mobile technology and the diversity of people in FM. To read the full article, go to the Facilities Perspective website and look for the member profile on page 103. Reduxo were pleased to attend the FMA Ideaction 2016 in Melbourne this week. "To chat with your peers in the industry and learn from the speakers was very beneficial" said Leanne Cluley, Reduxo's CEO. "To support our members and the FM industry is an obligation for all of us and I look forward to working with the FMA's Diversity Team to look at encouraging more women in FM. The Diversity Team is not limited to gender but also focusing on age and culture. We certainly need more young people coming through and to let them know what a great career it is." The work of Facility Managers and associated support industries all working together to maintain our buildings and ensuring compliance affects all of us, from Schools to Hospitals, Commercial, Government and Office Buildings to Banks and Retail. It provides a diverse portfolio and opportunity to work anywhere in Australia and the world! Well done Nic Burt, Kris Greenwood and the FMA team on a great event. Looking forward to the Gold Coast next year. Reduxo is moving this week to new gigs in the Docklands. With a little more space and beautiful surroundings, we look forward to being in the CBD and sharing expertise with some great partners. Our new address is at the modern Lifestyle Working Collins St Building, as it says on their website, this building is based on a new way of thinking. Lifestyle Working Collins Street represents a balance between work and health, family and leisure. Combining community and culture, the environment and finance. These 3 principals were the core of the planning and design. In addition, Lifestyle Working Collins St has 5 Star Green Star Certification! All other contact details remain the same. Drop in and say hi! Leanne has been asked to speak at the Facilities Management National Conference Ideaction 2015 at the Adelaide Convention Centre. The conference runs from 24th to 27th May and allows the facilities management industry to come together to share ideas. The theme this year is "Changing the Game" so we are expecting some great discussions on how we can do things better and continually provide an improved service to our customers. Leanne is speaking at 11.30am on Tuesday May 26th, with her presentation title of "Asset Management - Single Source of Truth". With over 25 years experience in asset management, Leanne will share her knowledge on how asset management is often the responsibility of different departments and the benefits of facilities and finance working together for the "greater good". Management need to be aware of the importance and educated on the benefits of implementing asset management. Should we not be aiming for one asset register that is a “single source of truth”. Ideaction.2015 is also an opportunity for the industry to get together formally and informally. We hope to see you there in May. 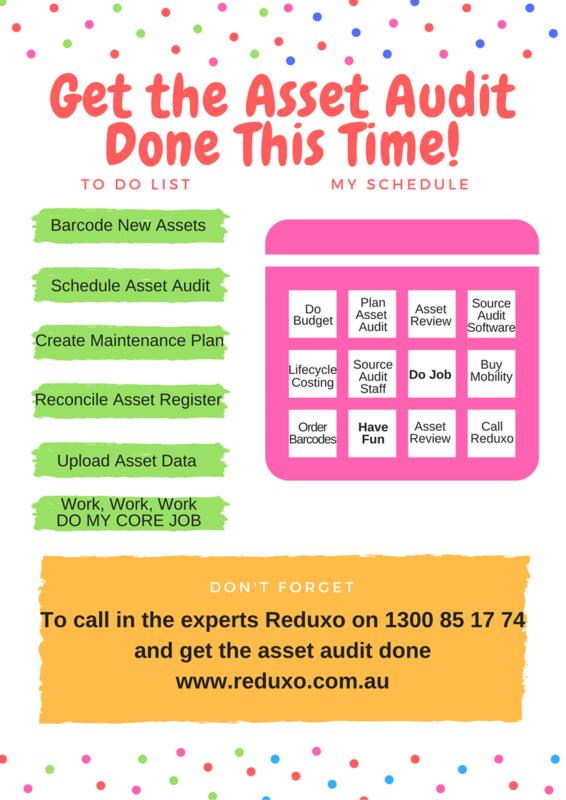 Asset management specialist, Reduxo, has launched a market-first rolling audit service to help property management, leisure, mining, aged care facilities and retail companies avoid financial misappropriation and remain compliant when it comes to managing and disposing assets that sit on the company balance sheet. The service allows organisations to take control of their physical assets, often numbering into the thousands, in what is a largely neglected yet significant component of a company's finances. Reduxo will maintain an organisations asset register by barcoding “new” assets and verifying existing assets. The process will ensure the asset register is maintained and the client will be provided with any changes to locations and updates either in an agreed Excel format for import into their financial system or Reduxo can use their existing mobile audit solution and update directly. “We've launched this service not just to help companies save money but also to avoid the blame game that typically takes place when it comes to board level review of assets. Often people don't know what assets they have, how much they cost to maintain, and whether they need to be retired, and worse, whether they are compliant. This is a precarious scenario for many vertical sectors, such as healthcare provision, IT, resources companies, or the leisure & retail industries said Leanne Cluley, Director at Reduxo. Organisations in Australia need a complete and accurate asset register for combined operational and financial purposes, and ongoing asset additions and disposals need to be managed. Typically, an organisation may perform ad hoc audits at a point of acquisition, merger or time of financial difficulty yet neglect to maintain up-to-date records in between times. Reduxo's service offers an upfront fixed fee, regardless of how many assets are under management, and represents a 30% reduction of the average ad hoc asset audit. It also means that assets are visible and accounted for at any given time. · ensure operations and finance are aware of additions for pro-active maintenance. Reduxo, the Australian partner for eRequester are pleased to announce organisations utilising Microsoft Dynamics AX can now take advantage of the benefits of using eRequester, a web-based purchasing and expense management solution. Full integration utilising web services for master data such as vendors, items, GL accounts, financial dimensions and procurement categories are now integrated. This ensures Dynamics AX and eRequester are aligned, up-do-date and running current data at all times. With eRequester you can now review your commitments at any time and take control of procurement. eRequester will streamline your purchasing processes and provide visibility and control including budget control. Additional features include 2 or 3 way matching, punchout to vendor websites, request for quotes, mobile approval and multi currency making eRequester a fully functional procure to pay solution that can be configured to suit your organisations requirements. Reduxo are pleased to announce Leanne Cluley is speaking at the Facilities Management Conference in Aged Care on October 30th 2014. Leanne has been asked to speak regarding Asset Management and her presentation is titled Managing Assets - Considering All Angles. Asset Management is an import component of managing aged care facilities and requires an accurate asset base to ensure all facilities and assets are maintained and compliant. As our population ages, looking after our elderly mums, dads, uncles and aunts is an important job and has created a growth industry. The conference will be of benefit for Owner/operators, Developers, CEOs, Facilities Managers, Maintenance Managers, Purchasing/Supply Managers, CFOs, Executive DONs, DONs, Architects, Designers, Building Contractors & Project Managers working in/with Residential Aged Care Facilities. eRequester e-procurement solution is now certified as PunchOut Ready, which validates its streamlined online ordering process from requisition through receiving leveraging the Procurement PunchOut protocol. The certification comes from Supplier Solutions, Inc., a company that specialises in vendor PunchOut integration services. Supplier Solutions validates vendors and procurement solutions for cXML compliance to ensure streamlined connectivity between vendors and buyers. As retailers use online shopping as a streamlined way of connecting goods and services to their customers, B2B suppliers are also benefitting from electronic ordering via e-procurement. Procurement managers are able to leverage a specific electronic ordering protocol called Procurement PunchOut to be able to order from their vendors in real-time. "Traditional procurement processes have historically involved paper based requisition and purchase order forms and a lot of back and forth between an organisation's buyers, the original requester and their vendors. It leads to duplication of effort as well as less control and oversight over the procurement process and the costs involved. Using eRequester as the eprocurement system provides a predictable process and improved ordering communication, both in-house and with outside vendors, an a prove method of managing costs via a built-in approval process." With the official PunchOut Ready certification, online ordering from eRequester, already highly rated for ease-of-use by Gartner, is even more straightforward. The turnkey and enterprise solutions from Supplier Solutions offer vendors an eRequester integration module for ease of integration. eRequester customers gain access to over 1,000 PunchOut Ready vendor eCatalogs from Supplier Solutions with which they can establish buyer relationships. Reduxo congratulates Dematic Australia for achieving Silver Partnership Status with the NSW Government's Sustainability Advantage Program. The program recognises excellence in environmental performance and commitment to sustainability. At the ceremony, held at the Museum of Contemporary Art, Sydney, NSW Environment Minisiter Robyn Parker acknowledged Dematic and 40 other NSW businesses for their outstanding environmental achievements. Dematic's Silver Partnership marks another step in it's continuous process of improvement, along with the organisation's ISO14001 certification. More information on this great achievement is available by clicking here. create a winning formula for its web applications: ease-of-use, quick return on investment for clients, scalable technology platform and customer satisfaction. What is the Real cost of paper-based systems? Computerized Maintenance Management Systems (aka: Asset Maintenance Software) have become standard fixtures in companies with daily work orders to be completed in a specific time frame. Paper-based CMMS systems allow each worker to receive daily print-outs of the maintenance or installation jobs they need to complete, along with any special instructions or considerations. While a paper-based CMMS has its advantages in terms of basic efficiency, it also comes with hidden costs, and these costs extend far beyond the expenses of ink and paper. These drawbacks are often not apparent to the company owner and upper management right away, but their effects can accumulate over time and lead to a reactive rather than a truly proactive system for managing daily operations. Implementing a Mobile CMMS system allows each worker access to a digital upload of each work order, as well as other important data about facility assets and readings, and this information can be updated much more efficiently. Sprocket now offers Australian Asset & Facilities Managers a low-cost, high return on investment (ROI) solution that is totally web-based. With complete functionality and customisation capabilities beyond any other solution in the market, for all Asset & Facilities requirements, including support for mobile applications, a whole new breed of software is now within reach, and is also supported locally. Sprocket CMMS software is a robust, flexible asset management application easily scaled to meet the needs of your facility. Sprocket is easily customised, enabling you to streamline your workflow process in order to save thousands of dollars in unnecessary maintenance and operating costs. In fact, there's more to Sprocket CMMS than meets the eye – it's asset management software, maintenance management software, and preventative maintenance software all in a single, powerful platform. So your facilities management staff can work smarter, faster, and in real time. Reduxo is thrilled to have been appointed the Authorised distributors and support arm for Sprocket locally in Australia. Several Australian Organisations, looking to improve control and compliance over their direct and indirect spend have implemented eRequester as a best-of-breed, totally web-based solution. Up until now, Australian Organisations have been supported directly out of eRequester's offices in Seattle, USA. With the appointment of Reduxo as the Authorised eRequester partner in Australia, the Australian market now has the option for on-the-ground implementation and support.